Here are a few of the great testimonials we have received over the last couple of years at Phoenix Locksmith Pros. Our quality craftsmanship and honest pricing is what sets us apart from the competition, and our clients can definitely notice the difference! I SAVED ALMOST $200 OFF THE DEALERSHIP PRICE!! After hiring Phoenix Locksmith Pros to replace my ignition switch on my 2004 Ford Focus, I felt compelled to get online and write up a sincere review. I got off work yesterday and went to start my car only to find out that I couldn’t turn my key at all. After a few minutes of trying to force it, I gave up and called the nearest locksmith company, which was Phoenix Locksmith Pros. I expected the locksmith to try to rip me off and upsell unnecessary extras but he turned out to be really laid back, friendly, and non-pushy which was good. My new ignition switch with labor included ended up saving me almost $200 over the Ford dealership price I was quoted and best of all they were able to come out the same day and fix it. 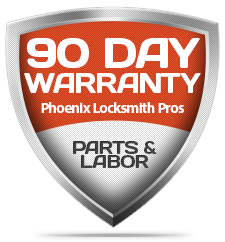 I definitely recommend these guys for anyone needing high quality and fair priced locksmith services in Phoenix, Arizona.